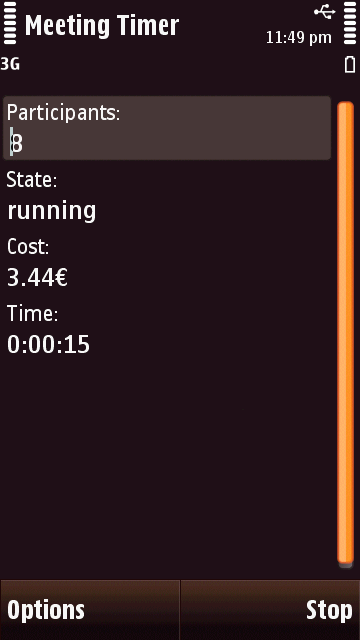 Configuration: Configure cost per hour for a worker and the currency to display the cost in. The configured data is stored in the phones persistent memory. You can use the tool like a stop watch: The tool supports starting, pausing and stopping the meeting measurement. You can change the number of meeting participants when the software is paused or stopped. The MeetingTimer.jar and MeetingTimer.jad files (version 1.1). The following is a screen shot of MeetingTimer running on an English localized Nokia N97-mini. Probably works with every up to date Java enabled MIDP 2.0 compatible mobile phone. All information contained on the pages are © copyrighted 2010 by the authors and protected by the law.